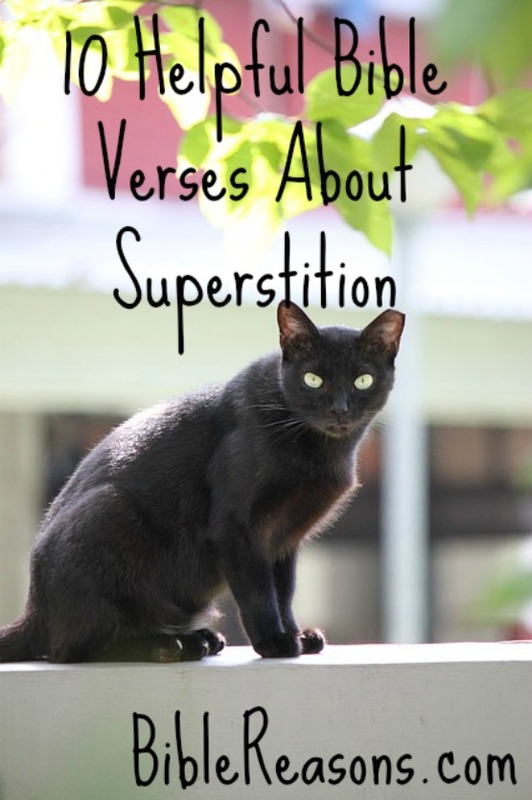 We all have heard about superstitions like Friday the 13th, knocking on wood, coming across a black cat, walking under a ladder, etc. To be superstitious is idolatry and it is trusting in things other than God. It is a slap in the face to Him showing that you don’t trust Him or believe in His Words. If God is for us who or what can ever be against us? God is in control of all situations never ever put your faith in silly myths, astrology, or other demonic things like witchcraft, but put your faith in Christ alone. 1. 1 Timothy 4:6-7 If you point these things out to the brothers and sisters, you will be a good minister of Christ Jesus, nourished on the truths of the faith and of the good teaching that you have followed. 7 Have nothing to do with godless myths and old wives’ tales; rather, train yourself to be godly. Be on guard from idolatry. 2. 1 Corinthians 10:14 Therefore, my beloved, flee from idolatry. 3. 1 John 5:21 Dear children, keep yourselves from idols. 4. Exodus 20:3-4 “You shall have no other gods before me. “You shall not make for yourself a carved image, or any likeness of anything that is in heaven above, or that is in the earth beneath, or that is in the water under the earth. 5. Proverbs 3:5-7 Trust in the Lord with all your heart, and do not lean on your own understanding. In all your ways acknowledge him, and he will make straight your paths. Be not wise in your own eyes; fear the Lord, and turn away from evil. 6. 1 John 5:18 We know that everyone who has been born of God does not keep on sinning, but he who was born of God protects him, and the evil one does not touch him. 9. Romans 8:31 What then shall we say to these things? If God is for us, who can be against us? 10. 2 Kings 21:2-6 He did evil in the eyes of the LORD, following the detestable practices of the nations the LORD had driven out before the Israelites. He rebuilt the high places his father Hezekiah had destroyed; he also erected altars to Baal and made an Asherah pole, as Ahab king of Israel had done. He bowed down to all the starry hosts and worshiped them. He built altars in the temple of the LORD, of which the LORD had said, “In Jerusalem I will put my Name.” In the two courts of the temple of the LORD, he built altars to all the starry hosts. He sacrificed his own son in the fire, practiced divination, sought omens, and consulted mediums and spiritists. He did much evil in the eyes of the LORD, arousing his anger. Colossians 2:8-10 See to it that no one enslaves you through philosophy and empty deceit according to human tradition, according to the basic principles of the world, and not according to the Messiah, because all the essence of deity inhabits him in bodily form. And you have been filled by him, who is the head of every ruler and authority.